The Academy Award winning performance of Natalie Portman as Nina in “Black Swan” can only be described as haunting. The film picked the Victoria Bed by Hillsdale Furniture as one of the key pieces of Bedroom Furniture in its set design to express the personality of it's lead character as she begins her dramatic personal journey. Natalie Portmant in "Black Swan"
When creating a room, whether it is for the set for a movie or your own home, you want to use a focal piece as a starting point. 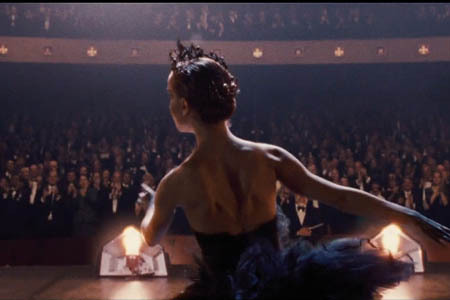 Houston, TX (PRWEB) May 5, 2011 -- The Academy Award winning performance of Natalie Portman as Nina in “Black Swan” can only be described as haunting. The film picked the Victoria Bed by Hillsdale Furniture as one of the key pieces of Bedroom Furniture in its set design. As the young Nina breaks in her new shoes and prepares for what she hopes is a restful night, we get a glimpse of her room. Just like the character’s life, it is caught in the twilight world between a child and woman. Stuffed animals and a music box intermingle with the tools of her trade. At the center of this room is a beautiful metal bed that looks like it is from another time. It boasts simple and elegant design with an old world charm displayed in its tiered arches. Such a bed looks like it would fit nicely in a garden room or perhaps a Victorian Era Bed and Breakfast. Perhaps this is just the idea that Hillsdale Furniture had in mind when they created the Victoria bed that was used so brilliantly in “Black Swan”. The movie shows how a young woman’s perseverance and dedication can win you the leading role in the ballet “Swan Lake”, but the cost of perfection may be higher than you are willing to pay. It also shows how a young dancer striving for perfection in a role of a lifetime begins finding her darker side in one of the psychological thrillers of the decade. Audiences flocked to the theater to help unravel the psyche and mystery surrounding this ballet star. The movie also portrays how people are free to make our own way in life and that perfection is just around the corner if they are willing to look deeper into themselves. Portman’s character began in a world of innocence and purity that deeply tapped into the “White Swan”. She discovered the “Black Swan” in her psyche that led to her success and crisis. Her space reflected these things in a way that was visually appealing to a world audience. Many beds, headboards and daybeds with trundles by companies like Hillsdale Furniture and Fashion Bed Group can help create a room that reflects each person’s own personal style and connect with their own “White Swan” or “Black Swan”. Victoria Bed by Hillsdale Academy Award Winner Natalie Portman "Black Swan"